In this GA release, WAVE OnCloud introduces two new wizards to streamline the addition of Customers and Radio Gateways. Additionally, account setup information sent to Customers has been modified and enhanced onboarding instructions. This release is generally available on October 24th. The Customer Creation wizard is available in the Partner Portal and intended for use by Partners to quickly create new WAVE OnCloud Customer accounts. Admins may change the default number of allowable TalkGroups and Users (Licenses) depending on the needs of their customers. This applies to standard and demonstration accounts. Admins may add billing and technical contacts to the customer record for quicker billing inquiries or technical support and troubleshooting. Admins may automatically create a WAVE OnCloud user from the billing or technical contact or both. Customer Administrators will receive an automated email notification with admin login to the admin portal as well as login information to the mobile app to immediately start using the app and invite others. At the top of the Customer’s page you’ll find the new ADD CUSTOMER button. Clicking the ADD CUSTOMER button opens the ADD CUSTOMER wizard. Follow the instructions and complete the fields in each section. When you have completed, all the information required for the creation of a new Customer account will be entered and the new Customer will be created for you. The Radio Configuration Wizard is available in the WAVE OnCloud Portal. Using this wizard, WAVE OnCloud Radio Administrators at Partner Companies can now configure WAVE OnCloud LMR integration using a simple step-by-step wizard. 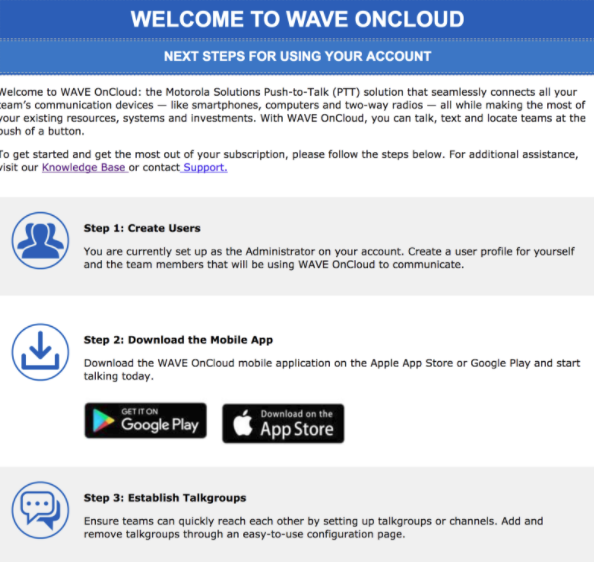 Radio Administrators can connect a WAVE OnCloud account with a radio system, assign TalkGroups, and create radio users, in a minimal number of steps. The Radio Configuration Wizard automatically launches whenever you create a Radio System in the WAVE OnCloud Portal. The wizard provides a easy to follow sequence from creation of a Gateway to the configuration of Radio Users. Along the way, help text is provided next to each field providing additional instructions and explanations. Simply click inside a field and read the instructions at right. WAVE OnCloud account owners and users now get more structured emails with clear next steps.